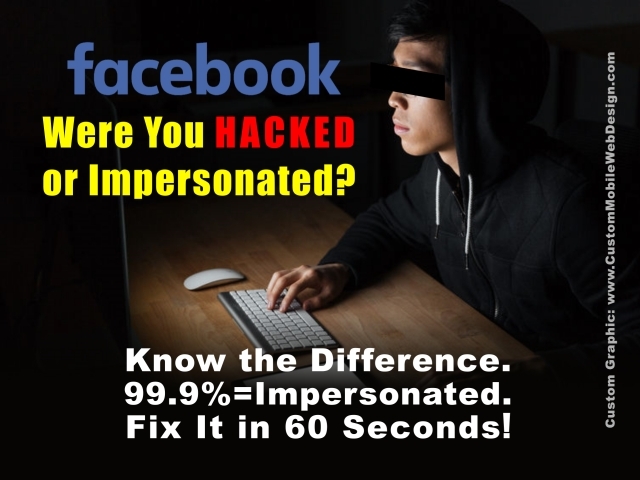 Please review our Facebook Hacked or Impersonated tutorial before you panic over fake Facebook duplicate friend requests. Were You Hacked or Impersonated? If “hacked” they would have access including your password and changed it, then be posting on your wall. You’d be locked out. If someone created a new account and “impersonated” you, borrowing photos and a copy of your friends list to send new friend requests, then your wall is safe. Easy Fix: Go to the fake account, click the three dots in the lower right of the cover photo (to the right of the Message option), and then select “Report”. Follow the step-by-step instructions to report the impersonator. Facebook security acts VERY quickly. The impersonator account is usually gone within minutes! In the past only the owner could file a report. Now anyone can. Got a duplicate friend request? Use the above steps to report someone impersonating a friend. If you cannot log in to your Facebook account, and see posts you didn’t create, you probably were hacked. It’s rare. Visit Facebook help files for a solution.